Doriann Stewart, a 12th grader at Mathematics, Civics, and Sciences Charter School holds up a sign during a rally for charter schools outside Philadelphia School District headquarters in Philadelphia. Decrying a proposed policy shift they say would hamper their ability to operate charter schools in Philadelphia, dozens of administrators, parents, and students demonstrated outside the city's school district headquarters Wednesday. The School Reform Commission is scheduled to have a first reading on a new charter policy Thursday and would presumably adopt it in March. Charter officials said the policy, which would govern charter school amendments, is onerous and represents "an overreach" by the school system, said Amy Hollister, CEO of Northwood Academy Charter School in Frankford. She and others said the policy could require them to clear even small school changes through the district, a violation, Hollister said, of Pennsylvania charter law. "If this gets enacted, the district can come in and tell us what to do," said David Hardy, a retired charter school founder now employed by Excellent Schools PA, a pro-charter nonprofit. "The charter school office is not the superintendent of charter schools." District officials reject the notion that they are overstepping their authority; they say they have given charter officials the opportunity to weigh in on the policy and have already revised it to incorporate their suggestions. "This policy will allow charter schools the ability to amend their charters during their term — something charters cannot do right now," said district spokesman H. Lee Whack Jr. "If we do not enact this policy we will fail students, parents and charters." 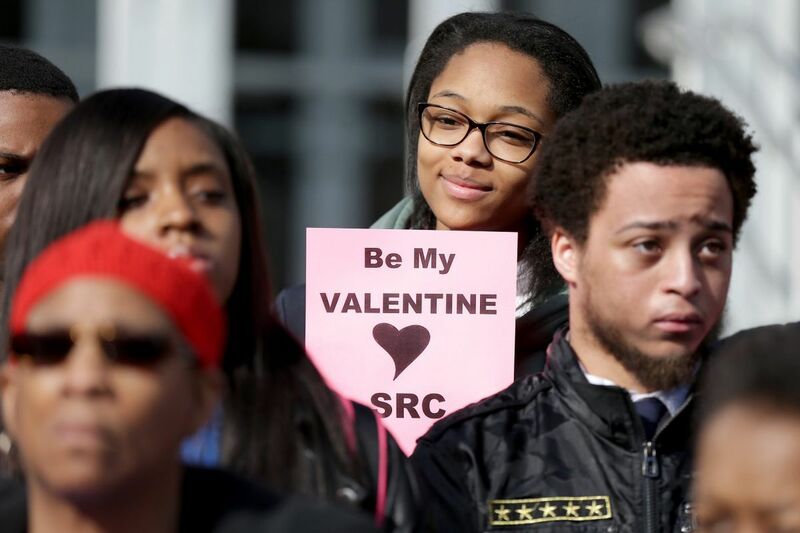 The charter community says the revisions do not go far enough and wants one-on-one meetings outside of public SRC sessions. At the heart is the continuing tension between Pennsylvania's charter schools, which operate with taxpayer money but are run by independent boards, and its traditional public schools, which authorize them. Nowhere is that tension more acute than in Philadelphia, where about 70,000 children attend 84 charter schools at significant cost to the school system. Seventeen Philadelphia charters have refused to sign operating agreements because they feel the district is demanding too much. And now, the looming policy is continuing the tension. Outside the Philadelphia School District headquarters on North Broad Street on Wednesday, about 80 people held signs handed to them by protest organizers: "Don't Take Away School Choice" and "Be My Valentine SRC, Table #406," a reference to the charter amendment policy number. Among the group were students who left classes at the Mathematics Civics and Sciences Charter School across the street. Christopher Johnson, an official with KIPP Philadelphia Charter Schools and a KIPP Philadelphia graduate himself, said it was not wise of a lame-duck SRC to jam through the policy. Johnson hinted at a "likely legal battle" if it did so. Herbert Mohammed, a Mastery Charter school parent, said he chose a charter school for his two daughters because he believed it to be better and safer than the district alternative. Mohammed suggested the district was attempting to smear charters. "We have to stop misleading the public by saying charter schools don't work for families," Mohammed said. After their rally, the protesters delivered a letter to the SRC on behalf of 65 charter schools — the vast majority of city charters. It called for a slow-down on the policy until a working group with charter representation is formed, and it called for negotiations for "fair charter renewal agreements" for the 17 schools that currently lack them. Hollister said the proposed policy would just mean more paperwork and less time and money for her school to spend on education. Enough with the onerous regulations, she said. "It's overarching," Hollister said. "It's overreaching."